Oil-less or oil-free compressors are becoming more popular among modern dental practices. 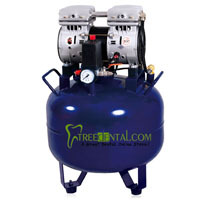 One significant benefit of oil-free dental compressors is they are maintenance-free. A disadvantage to oil-less compressors is a higher heat output and possible condensation. The most important aspect to look for in a dental compressor is air quality- ideally air that is dry, hygienic and oil-free. Choosing a dental compressor that features a high-grade coalescent filter as well as fresh air intake can help attain this goal. Depending on the size of your dental practice, different oil-less models can support 1-10 dentist/hygienists simultaneously. Power depends on the size and necessary output of the compressor, but can vary between 1-5 Hp. It’s a good idea when purchasing a oil-less compressor to inquire about a sound cover and exhaust silencer, these can help keep noise levels down. Be sure to choose a reputable vendor that offers an extensive warranty. A product like an oil-less compressor is a long-term investment and quality should not be sacrificed.